After taking their show on the cruise liners and making their TV Debut on Sky One's glamorous singing contest Sing: Ultimate A Capella, Timeless return to their first home - the stage. Join Hampshire's very own vocal harmony trio Timeless on Saturday 31st March 2018 for a 'Vintage Party'. 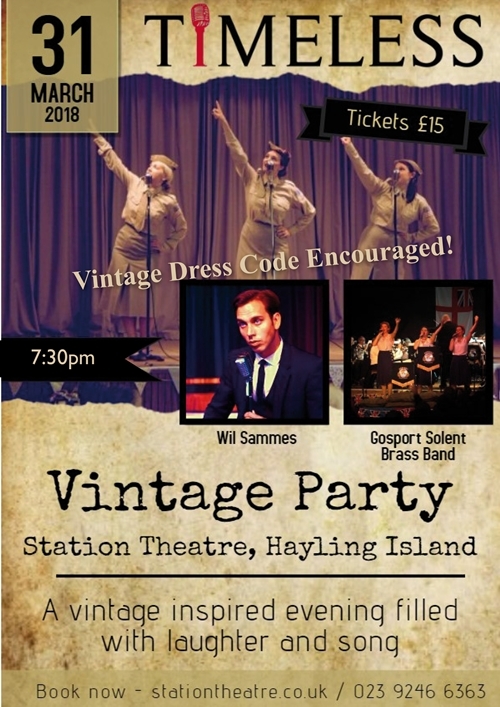 Timeless will be performing amongst friends at The Station Theatre, Hayling Island, taking you on a musical journey through the 1940's and 1950's. With special appearances from Gosport Solent Brass Band, conducted by the enigmatic Colin Garner and smooth vocals from local crooner Wil Sammes. A vintage-inspired evening filled with laughter and song, suited to those from 4 to 104! Vintage themed dress code encouraged! Please use these links for more information.